Why was I glad? Because BP was not guaranteed. Not only was there a “flood watch” in the forecast, but this was a dreaded weekend day game–the absolute toughest time to snag baseballs. If it were up to me, I would not have attended this game. But it wasn’t up to me. I had Watch With Zack clients, and this was the game they picked. The photo on the right shows me with the two of them, and yes, they’re both grown-ups. This photo was taken at about 11am. By that point, batting practice still hadn’t started, and the right field seats (as you can see) were already packed. Not good. As for my clients, the man standing next to me is named Eli (pronounced “Ellie”), and the woman on the right is his wife Kathryn. They’ve been married for 20 years. She grew up in Kansas City and went to a ton of games there. He grew up in Israel and only recently got into baseball. This was just the fourth game he’d ever been to, and it was the first time he’d ever arrived in time for batting practice. Needless to say, he’d never gotten a ball from a game–and neither had she, but that wasn’t why she had hired me for the day. I was, in effect, Eli’s surprise birthday present. (Kathryn always orchestrates some type of surprise for his birthday; last year she flew a bunch of his friends in from Italy.) I was there strictly to teach him about baseball and to help him understand all the rules and strategies and nuances and statistics, etc. The Yankees finally got started at around 11:30am. I had two close calls but ended up empty handed. (The sun got in my eyes on one; a security guard got in my way on the other.) No big deal, right? I’d snag a bunch of balls during the Athletics’ portion of BP…right? The Athletics didn’t take BP, but no problem, right? I’d just get a ball from one of the pitchers playing catch in left field…right? Even though I was decked out in a rather eye-catching Athletics costume, no one threw me a ball. And then the grounds crew took the screens down and started preparing the field for the game. My streak was in serious danger of ending. I’d gotten at least one ball in each of the previous 606 games I’d been to–a streak dating back to September of 1993. And now I could feel the whole thing slipping away. In fact, I was convinced that it was going to end, and not only that…I was going to have to refund the $500 fee that Kathryn had paid me. That’s part of the deal with a Watch With Zack game: No ball = epic fail = full refund for the client. His name is Stuart Jon (check out his web site) and he’s been reading my blog for quite some time. After many many emails (and his pledge of three cents per ball for my charity), this was the first time we’d met in person. Knowing I would be at this game, he brought both of my books and asked me to sign them for his one-year-old boy named Charlie. The A’s players had come out to stretch and run and throw. THIS was going to be my chance to get a ball, but it wasn’t going to be easy. I couldn’t go in front of the railing (the one with the drink holders in the photo above), so I was somehow going to have to get the players’ attention and convince one of them to launch a ball over eight rows of seats and dozens of fans. I had done it before, but it was always tough. My streak was alive. They both had a ball. I could relax…and that was great because there wasn’t much I could’ve done during the game anyway. We were sitting in the middle of a long row, one and a half sections from the end of the 3rd base dugout. Great seats to watch the game? Yes, of course. Great seats to catch a foul ball or a 3rd-out ball? Erm…no. I’d bought the tickets off StubHub, which unfortunately doesn’t provide seat numbers so there was no way to find out (until the transaction was complete) if we’d be on the aisle. So yeah, we were all trapped there, but given the fact that I’d snagged those two baseballs, it was actually nice to sit still and focus on Eli and not have to worry about adding to my total. I don’t have good luck with waiter-service-food at baseball games. This was only the second time I’d ever ordered it. The other time was at Turner Field nearly a decade ago. I’d snuck down into the fancy seats with a friend, so we ordered food and before it arrived, we got kicked out by security. We’d already paid for it, and thankfully we were allowed to wait at the top of the section (in the cross-aisle) until it arrived. It was highly embarrassing. I sat next to Eli during the game and explained stuff nonstop from Watching Baseball Smarter. He already knew quite a bit (including the infield fly rule), so it was a challenge at times to come up with things that were new, but I found a way. The “4142” represents my current ball total. That’s how I sign everything snag-related. Final score: Yankees 7, Athletics 5. …and when we got outside (and because Kathryn and Eli’s camera battery had died), I took one last photo of them, which you can see below on the right. • 322 balls in 38 games this season = 8.47 balls per game. Nicely done! So did Eli have any off-the-wall questions for you? Seems like it was a well deserved low-key day for you. It’s good to have those every now and then! You can tear it up next game! Hey, this is my first response to your blog, which I have been reading for a long, looooooong time. I find it very instructive, full of love for the great game of baseball, and extremely well-written. In your blog “This was also my lunch” is so funny it made me larf out loud!. I didn’t realize you also take grown-ups for “Watch With Zack.” Hm. Verrry interesting. P.S. I really like your book “Watching Baseball Smarter.” Between your enthusiasm, your books and how you have codified snagging for fans, you are giving the tarnished sport a good spin. Maybe MLB should hire you as an ambassador of good feeling. Sounds like a nice quiet day for you. I guess everyone deserves a break right? Thanks to you I had an 8 ball performance at Kauffman Stadium recently. Keep on snagging! Great to finally meet you, thanks for the time which was, at that moment, very valuable!! Hope to catch you at another game in the future! July 27, 2009 - 10:19 am . What’s good with this Tuesday and/or next Monday (8/3) at Citi Field broskii? Quick update…I’m about to leave for Baltimore. Orioles versus Royals tonight. Just one game there. Then I’m heading home. Forty percent chance of rain during BP hours. Fingers crossed. I’ll answer comments (on this entry and the previous one) when I get a chance. zack, was there a lot of bleacher creatures dring batting practice? 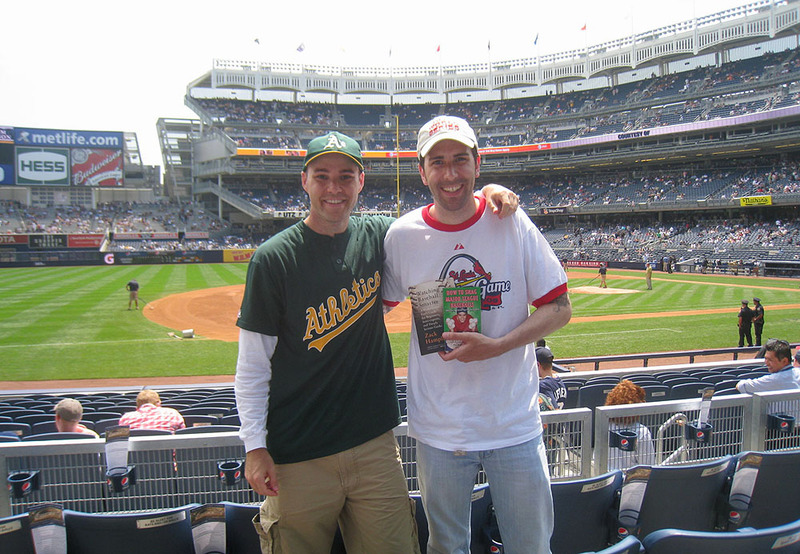 Zack Hample is human – Just 2 balls! I did not mean that the way it sounded, what I meant was you didn’t grab 10 or 11. Ugh, still sounds wrong! Anyway, any thoughts of another trip out west? I got #3800 (total MLB Balls includes ST) yesterday at Anaheim in an unconventional way but it still counts since it was a MLB ball and I got it inside a MLB stadium! Phew! That was close i was getting worried that the the streak would finally end but you pulled through as we have all come to expect of you. Do you really think I would not have paid you if you hadn’t snagged a ball??? I hired you for the game experience, not for the baseball! That was the icing on the cake! So, why shouldn’t adults hire Zack??? Husbands – you complain that your wives aren’t interested in baseball. have you ever explained the game to them? given them a book? Sent them to a baseball game with Zack? Wifes – if you are a baseball fan and want the ideal husband, here is a place to start. My husband is now so totally into baseball that he calls me up to discuss the pitching on day games. Our nearly perfect marriage is now absolutely perfect. Thank you, Zack. it was fun! Good job, Zack. You know you’re playing with fire going to Yankees games. That stadium seems built to destroy streaks such as yours. Its truly amazing the numbers you pull out of that place. On another note, I noticed you in a youtube clip of Kings of Kong (I think that’s what its called). You get around, sir. I gotta see that doc. Looks pretty funny. To cookandsonbats: if you want to catch Zack in action as arcade game whiz, Google zack hample arkanoid champion (which laurel he snagged at age 24). Before I left my house for the Mets game today, I checked AccuWeather quickly and saw one stray shower heading straight towards Queens. All I could do on my way there was pray that the shower would miss Citified, and BP would take place. As we pulled into the parking lot, it began to pour, and I caught up with Greg and Gary. We walked around the stadium as it continued to pour, and discussed our plans. Gary and I were going to stay but Greg was heading out. After a torrential downpour, the skies cleared up at 330, but I knew Bp would be canceled. I was so disappointed because I had Sterling Club tickets, so I was able to enter through the LF VIP gate, which opened at 440. I later found out that the JRR didn?t open until 450, so I would?ve had the entire stadium to myself had there been BP. When I ran in, Dave Racaniello and Jon Niese were just finishing throwing in center field. I asked Dave for the ball, and he told me there was already one in the seats. I looked around, and found a ball sitting in a puddle in the first row. I picked it up and was thrilled to see that it was a CitiField commemorative ball, but it was soaked and the logo was a bit scuffed on the bottom. My entire goal for the day was to get a CitiField commemorative ball, but this one wasn?t good enough. When the Mets pitchers started throwing in RF I, was able to get Pat Misch to throw me a decent Shea stadium commemorative ball. It looked like the entire bag of baseballs that the Mets pitching staff had was of the old Shea Stadium balls. I then got an amazing Black Angus burger, and moved to LF where Colorado pitchers Josh Fogg, Rafael Betancourt, and Jason Marquis were throwing. When it started to pour (again) Fogg ran in and threw me one of his baseballs, which I then gave to a kid who was also asking for it. Next I decided to hang out behind the Rockies dugout to try to get a ball from one of the players when they finished their pre-game throwing. But all the players threw in shallow LF and I got kicked out just before game time. I moved to my seats in the Sterling Club (which is like Philadelphia, where you can look down into the batting cages) for the top of the 1st. During the break I snuck back down behind the Rockies dugout, hoping that the catcher of 1st baseman would end up with the ball because I positioned my self behind the home plate entrance to the dugout. When Dan Murphy grounded out to the 2nd baseman, I was bolting down the stairs, but my heart began to sink when 1st baseman Garret Atkins began running towards the outfield entrance of the dugout. I started screaming ?Garret!? at the top of my lungs and the kids around me heard me yelling his name and started doing the same. He looked over and I waved my hands, and then watched as he lobbed the ball high in the air. I stuck my glove out and at the last second saw a bunch of hands reach out, but I was overjoyed when I felt the ball smack into the palm of my glove. It was a near perfect, game used commemorative ball! I was thrilled, and for the rest of the game just chilled in my seats. When Fernando Tatis hit a grand slam in the bottom of the 8th to give the Mets a 7-3 lead, I moved to the end of the Mets dugout, where the umpires exit the field. As soon as Brad Hawpe grounded out to end the game, and home plate umpire Charlie Reliford started walking towards the exit, I was shouting his name. As he neared the exit he reached into his pocket and threw me a decent knuckle ball that landed right it my glove. Another commemorative ball! I accomplished my goal, but was very disappointed that Bp was canceled, but I think 5 balls is a respectable number for a game without BP. Do you have any tips on snagging at Safeco Field? Stats Error for your 2007 Totals !! Looking at your Final Stats for 2007, I have found an error. You list 316 total balls. Total by stadium and by portion of day both add up to 316 balls. However, when adding by month, total is 336 (April..35, May..56, June..41, July..25, August..41, September..133, October..5). Hey zack been a while since I left a comment …I have a question, Do u happen to have a Rockies roster sheet? Im going to see them Wednesday night. Thanks! Thank you all for the comments. I’ve read them all, but since I’m super-busy at the moment, I’m only going to answer the ones with questions. No Citi tonight or tomorrow. I might be there on August 3rd, but I’m leaning more toward August 4th. It’s hard to say who was a bleacher creature and who wasn’t. All I know is that it was packed. Adults DO hire me, but I think this was only the second Watch With Zack game (out of 18 total) in which there hasn’t been at least one kid involved. Most of my clients are into the whole snagging aspect, but when that isn’t the case, it’s no big deal. I just shift gears and focus on whatever the clients want. Anyway, thanks very much. I had a great time with you guys, and I’m glad to hear that you had fun as well. Also…thanks for the pledges for Pitch In For Baseball. Unfortunately I don’t. I haven’t been there for years, and I was only there for one game, so I don’t remember much. Are you sure about that? Check the numbers again. I think I listed “113” for September. Just go to the Rockies’ web site and click the “Roster” link. Easy.